The Kala calendar is modeled after the Baha’i Calendar. This borrowing is based on mathematical symmetry, not religious or theological associations. 19×19 = 361 + 4 or 5 = 365 or 366, matching the de facto international standard Gregorian calendar. The 26th of February through the 1st of March is called the semahua, or “Week of Flowers”. This period includes the 29th of February in leap years. 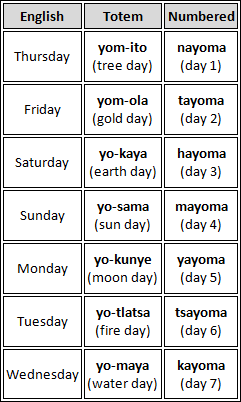 Based on this calendar, Cinco de Mayo would be mina te kita (South day of North month), yoma pa’o te sayo ha’o, or Day 8 of Month 3. Similarly, International Coffe Day, September 29th would be kita te nila (North day of Blue month). 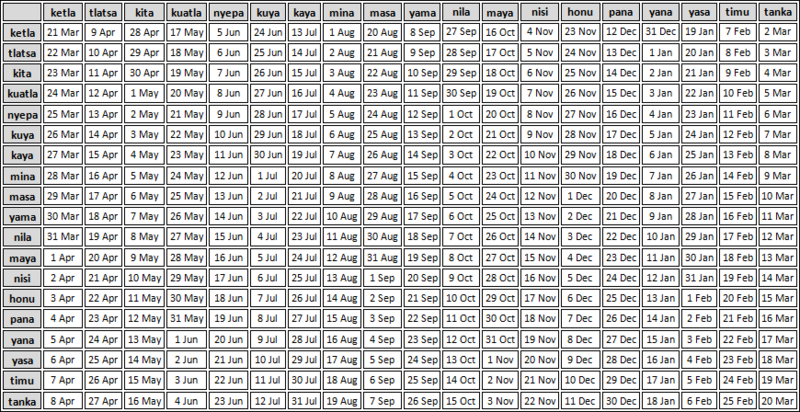 In the chart below, each column represents a sayo, or ‘month’ and the rows are the yoma, or days. Each of the 19 days and “months” can be referred to with totems. The totems represent directions, natural phenomena and animals. Each of the 7 days of the week can be referred to with elemental totems or numbers. The numbering begins on Thursday. The Kala daily clock is divided into three equal 8 hour segments. The morning (yomua), the midday (yotso) and evening (puama). 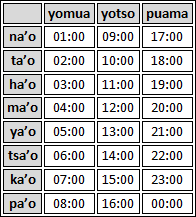 So, when asked what time it is, or when something should happen, instead of 9am or 5pm, one would say (tsima) na’o te yotso or (tsima) na’o te puama.